By all accounts, the LG G7 ThinQ has had a troubled history. The Korean company’s mobile division intended to launch the flagship at Mobile World Congress 2018 in March, reportedly, but put the breaks on plans after LG chief Jo Seong-jin ordered the team to “[start] from scratch” and find a “strong[er] selling point”. For a time, it wasn’t clear when the LG G6‘s successor would see the light of day—after LG posted a whopping 233 billion won ($219 million) quarterly loss in January (the 11th consecutive down quarter), Mr. Senong-jin cryptically told reporters at the Consumer Electronics Show that LG would launch smartphones only “when they [were] needed”. It’s needed now, apparently. In late April, LG invited members of the press to preview the LG G7 ThinQ, the newest flagship in the company’s six-year-old G series lineup. 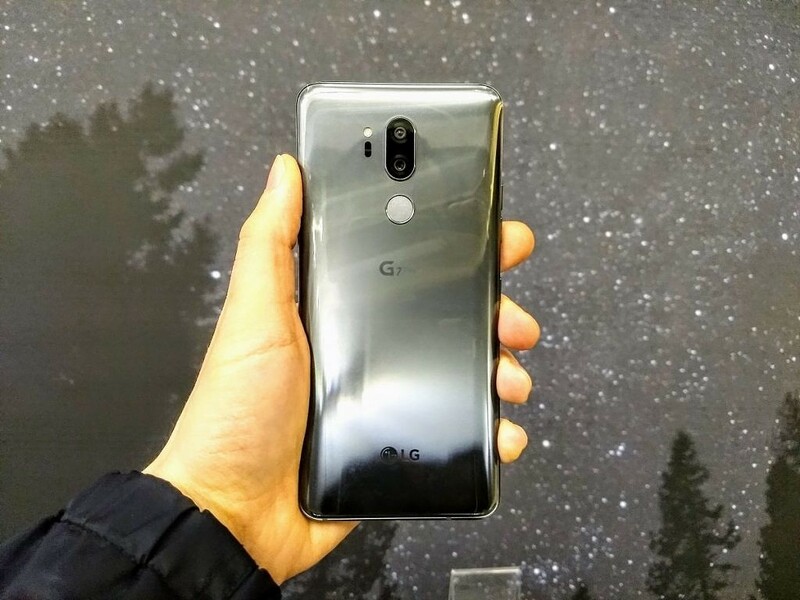 Besides the capricious “ThinQ” branding, which follows on the heels of the LG V30S ThinQ and the company’s broader effort to marry its mobile products with its SmartThinQ connected washing machines, dishwashers, dryers, and other appliances, the LG G7 is in many ways a return to form. It’s got a top-of-the-line Qualcomm Snapdragon processor (the Snapdragon 845), the world’s brightest smartphone display (Super Bright Display), and a suite of artificial intelligence-enabled apps that identify objects, optimize camera settings, and pick up voice commands from across a room. But the LG G7 ThinQ isn’t the only phone on the block with a speedy processor, bright screen, and AI features. It’s going head-to-head with heavyweights such as the Huawei P20, Samsung Galaxy S9, and Google Pixel 2, none of which pull any punches. Here’s how it compares. 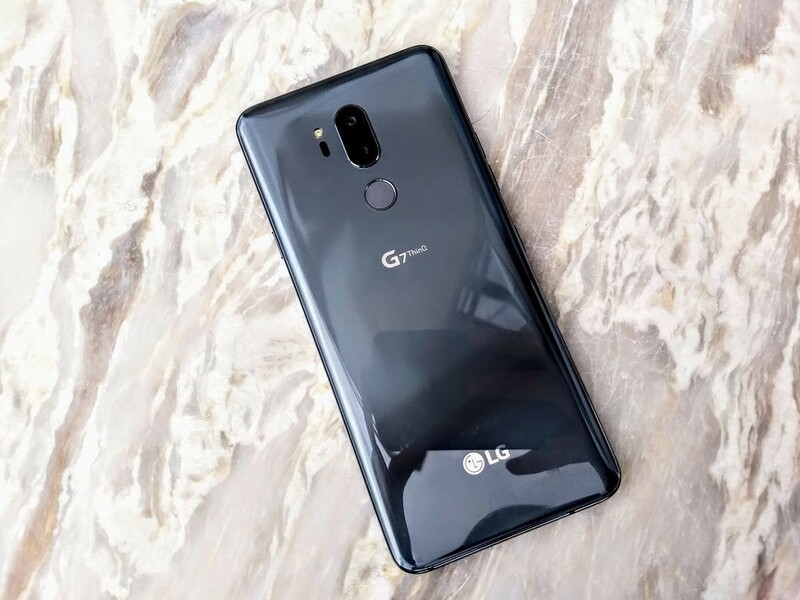 LG went back to the drawing board with the G7 ThinQ, substituting the garish aluminum frame that ran the length of the G6 with a thinner, chamfered, and ever-so-slightly rounder lip that bifurcates the back cover and front. It’s not seamless, but blends together in a way that the G6’s metal-and-glass body didn’t, contributing to a muted, refined aesthetic that wouldn’t feel out of place next to minimalist phones such as the Essential Phone. That said, the LG G7 ThinQ doesn’t quite clear the bar set by competitors like the Samsung Galaxy S9 and Google Pixel 2. It’s highly reflective, with a glossy surface that attracts fingerprints like a bug zapper attracts flies. But more disappointingly, there’s a hollowness to it (especially the rear cover) that’s out of place on a flagship phone. 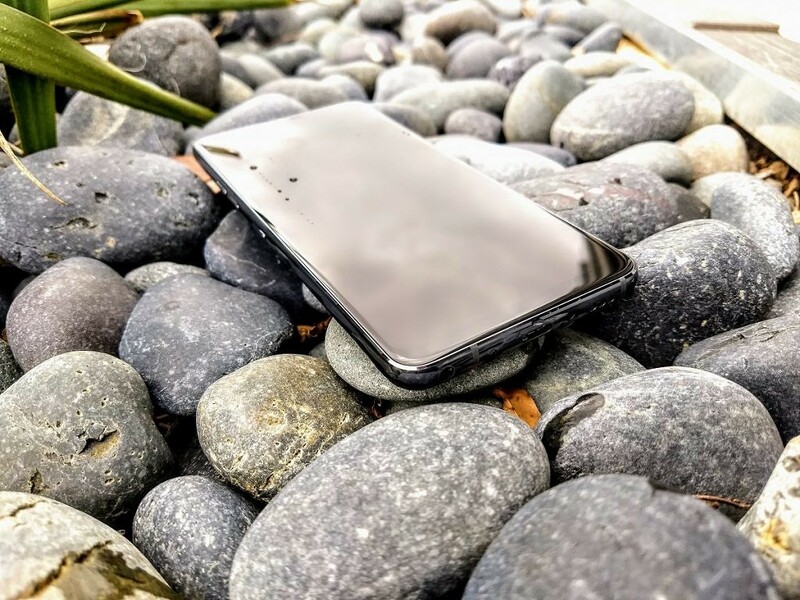 LG has long paraded the durability and weight advantages of its phone’s shells, and to be fair, those advantages are evident in the G7 ThinQ. It’s MIL-STD 810G compliant and IP68-rated for water exposure (certified to survive thirty minutes in a five-foot pool), which we promptly put to the test by dunking the G7 ThinQ in a pool. (Spoiler: it survived.) But we wish it felt a little more substantial. Dominating the front of the phone is a 6.1-inch Quad HD+ (3120×1440) 19:5:9 FullVision display that’s taller than the G6’s screen by a hair, with a bottom bezel that’s 50 percent slimmer. It’s the same aspect ratio as the Apple iPhone X, and there’s a reason: The screen runs the length of the G7 ThinQ’s bezels, stretching all the way from one end of the 2.5D curved Gorilla Glass 5 to the other, and there’s a small notch, which LG refers to as the New Second Screen, at the top of the display that houses the front-facing camera, earpiece, proximity sensor, and ambient light sensor. There’s much to love about the LG G7 ThinQ’s screen. The display covers 100 percent of DCI-P3 and Rec 2020 color spaces, the standard for digital cinema projectors and most 4K Ultra HD televisions and computer monitors. 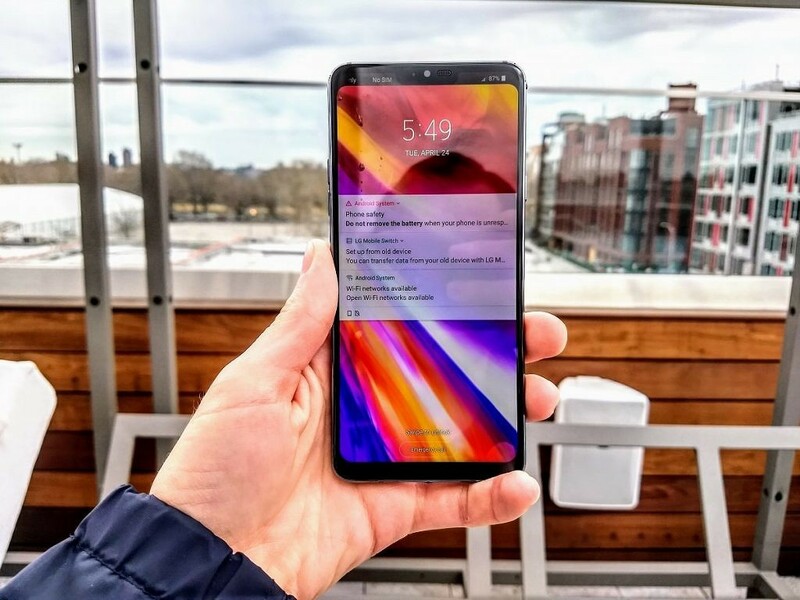 (The LG G7 ThinQ can display 1024 shades of each primary color for a total of 1.07 billion colors, or 64 times the 16.7 million colors the average smartphone can display.) And in Super Bright Display mode, which is activated by tapping a Boost button next to the screen brightness slider in the notification drawer, the ultra-bright backlight — which normally maxes out at 700 nits (equal to 700 candelas, or the amount of light emitted by a common tallow candle per square meter) — can achieve a maximum brightness of 1,000 nits for up to three minutes (to prevent overheating). To put that into perspective, the G7 ThinQ can get twice as bright as the Google Pixel XL, the Pixel 2, the OnePlus 3T, and the Galaxy Note 8, and almost 400 nits brighter than the iPhone 8. It’s all thanks to LG’s M+ technology, a feature found in LG Display panels from Philips, Hisense, and Haier smart TVs. Conventional RGB displays contain red, green, and blue pixels, and pass light through those three pixels to produce white. Unfortunately, only 30-40 percent of the light makes it through the color filters, with higher-resolution screens exhibiting sharper declines. That’s where MLCD+ comes in: The G7 ThinQ’s RGBW matrix display contains an organic insulator and significantly more white sub-pixels than conventional smartphone displays, which improves the light transmittance rate while reducing power consumption by 35 percent. Without a color meter on hand, we couldn’t put LG’s claims to the test, but the G7 ThinQ’s display nonetheless made a fantastic first impression. It’s just as vibrant as the marketing materials imply, with fantastic contrast and color reproduction (especially on the warmer end of the color spectrum) and superb viewing angles. It’s sharp, clear, and colorful enough to go toe-to-toe with any AMOLED screen we’ve laid eyes on, which is saying something. It’s only slightly hampered by G7 ThinQ’s automatic brightness adjustment, which is a tad too aggressive. Outdoors on an overcast afternoon, the G7 ThinQ’s display became dim and difficult to read on the default setting. Like the G6, the G7 ThinQ’s display can display high dynamic range (HDR) videos, TV shows, and movies, which boast improved brightness, a wider color gamut, and better contrast than non-HDR content. Specifically, it’s compatible with HDR10 but not Dolby Vision. That’s a shame—the latter has slightly more luminosity per square meter and uses less bandwidth compared to rival formats and 12-bit color instead of the standard ten. Considering the V30S ThinQ and LG G6 had it, it’s an odd omission. The G7 ThinQ can stream HDR videos from services that offer them, including Netflix, Amazon Prime Video, and YouTube. Not everyone will be as enamored by the LG G7 ThinQ’s default color profile, which is a little oversaturated. Luckily, it’s not the only option on offer. The G7 automatically switches between six different color settings depending on what’s being displayed, including Auto (the factory standard), Eco (an energy-saving mode), Cinema, Sports, Game, and Expert. You can’t toggle off individual modes, unfortunately, or manually associate apps with color profiles. But there’s some flexibility—the G7 ThinQ’s software allows you to fine-tune the RGB gamuts and screen temperature while the modes are active. So what about the notch? In the months leading up to the G7 ThinQ’s reveal, the cutout near the top of the screen was easily its most controversial feature. It’s real, for better or worse, but it isn’t as distracting as you might expect. It takes up about a third of the notification shade when the phone’s in portrait mode, and LG has optimized the G7 ThinQ’s Oreo-based firmware to display alerts to either side of it. An ellipse indicates when text has been truncated, with heads-up notifications appearing below the notch, and the notification shade cycles through colors to match app elements, in keeping with Android’s immersive mode. In tacit recognition that the display notch isn’t for everyone, LG included an option to “disable” it by changing the color of the notification to match the G7 ThinQ’s black bezel. On the home screen and any built-in default apps, the screen edges blend in with the phone’s bezel. It gives it the appearance of true notch-lessness, though the illusion’s broken pretty quickly. The LG G6 boasted exceptional audio post-processing, and the G7 continues in that tradition with a 32-bit Quad DAC. It taps four digital-to-analog converters, an amplifier, and proprietary algorithms to enhance the sound quality of every video, song, and podcast played through the G7’s 3.5mm headphone jack or loudspeaker by widening the dynamic range and boosting the bass. LG is promising improvements comparable to the G6’s DAC, particularly in the areas of noise reduction and sound distortion. Folks who closely followed last year’s G6 launch might recall that U.S. variants of the phone lacked the 32-bit Quad DAC, which to this day remains a Korean exclusive. (Equally as annoying is the lack of wireless charging on variants outside the U.S.) Thankfully, LG acceded to demands this time around, and most of the G7 ThinQ’s features—including the Quad DAC—won’t be region-specific. In other good news for audiophiles, the G7 ThinQ features LG’s DTS-certified Boombox Speaker tech, which uses the inner space between the G7 rear cover and loudspeaker (which is 39 percent larger than the G6’s speaker, LG says) to “increase the base sound level by more than 6dB with twice the amount of bass”. (LG says the resonance chamber is 17 times larger than its previous products.) At the very highest volume, the sound waves rattle the phone’s rear cover with every bass drop at ten times the loudness of a typical smartphone. In a soundproof booth at the pre-briefing, we compared the Boombox Speaker’s performance to the speaker in a Lenovo Moto G5 Plus. The G7 ThinQ easily bested the G5 Plus in a battle of decibels, which didn’t come as a surprise, but the sound quality left something to be desired. The high-frequency response is nothing to write home about, and the Boombox Speaker’s amplifying chamber renders bass a little muddled at higher volume levels. On the software side of things, the G7 ThinQ has a DTS virtual surround sound profile, DTS:X, that mimics a 7.1 channel surround sound system. The preloaded G7 ThinQ DTS app offers eight selectable presets customized for specific music genres (Normal, Classical, Dance, Jazz, Pop, Rock, Vocal, and Custom), a library of more than 400 custom-tuned audio profiles for popular headphones, and equalizer controls that offer finer-grain controls. 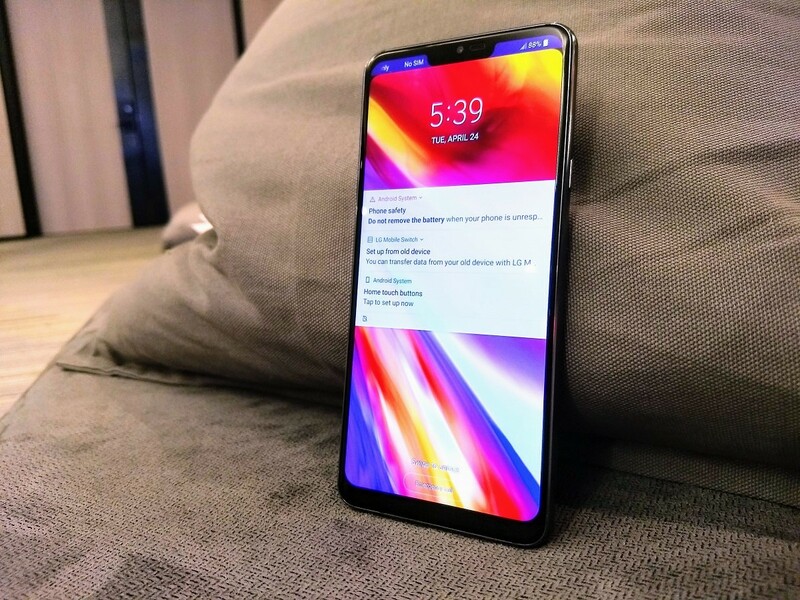 At Mobile World Congress in March, LG took the wraps off the LG V30S ThinQ, a mid-cycle refresh of the LG V30 that shipped with a notable software feature: AI Pack. It’s a suite of LG features that offer “personalized and useful AI functionalities with meaningful smartphone features,” including AI Cam, which recognizes objects and recommends shooting modes; Voice AI (or QVoice), which offers enhanced voice controls; and Bright Mode, which automatically brightens photos “by a factor of two”. The LG G7 ThinQ features the second iteration of LG’s AI suite, AI Pack 2.0, and AI Cam boasts the biggest improvements. Four filter presets offer different color, saturation, and contrast settings optimized for specific scenarios, an adjustable exposure setting that cuts down on unwanted light (e.g., direct sunlight), and a wide-angle mode that taps the LG G7 ThinQ’s secondary sensor to capture panoramic photos. Here’s the really neat part: AI Cam recommends filters and modes, including wide-angle mode and the optimal exposure setting, based on ambient conditions, much like the AI-powered camera app on the Huawei Mate 10 Pro. That’s not all—it also automatically switches among 19 different color and contrast filters (up from eight in the V30S ThinQ), including Person, Flower, Pet, Food, Sunset, Sunrise, Landscape, City, Baby, Animal, Beverage, Fruit, Sky, Snow, People, and Lowlight. In our testing, AI Cam had no trouble switching between filters and made sensible shooting recommendations. When we an orange was in frame, for example, it automatically enabled Food mode, and flipped on the Beach filter when we pointed at we pointed in the direction of folding chairs in front of a pool. AI Cam has another trick up its sleeve: Vision AI. 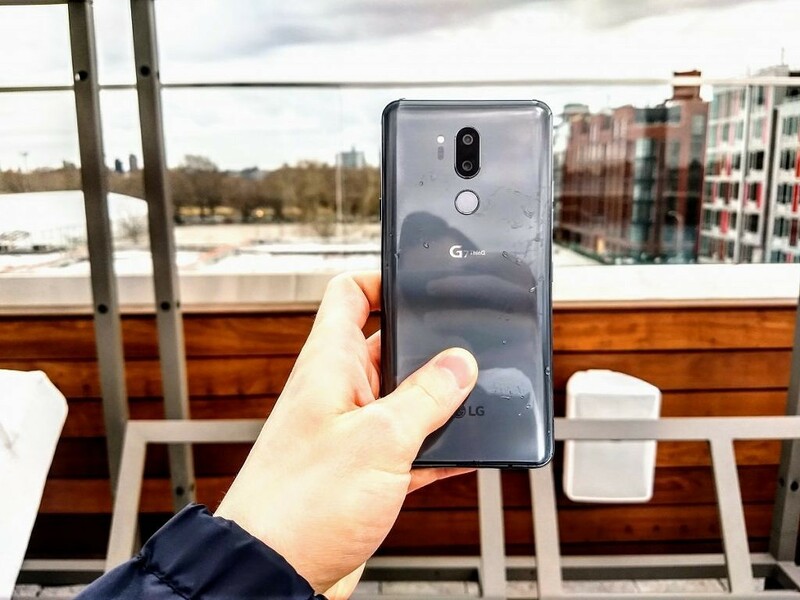 Much like the Google Lens, the LG G7 ThinQ’s camera can recognize 1,162 objects in-frame, including food, animals, and notable landmarks. LG teamed up with machine learning company EyeEM to train its computer vision algorithms, which don’t require an internet connection, on more than 100 million images. Vision AI worked fairly well in our testing, highlighting identified objects with a word cloud of text annotations (LG calls them “QTags”) that fade into the background. It had no trouble picking out fruit, the aforementioned folding chair, and a sheet of printer paper. It did, however, misidentify a pillow as a carpet. In Korea, the LG G7 will ship with LG’s QLens, a Bixby-like assistant that can scan QR codes and pull up the lowest prices for products on Amazon, or find matching images of food, fashion, celebrities, and landmarks on Pinterest. Functionally, it’s identical to the LG V30S ThinQ’s visual search, and right now, LG’s not planning to bring it to U.S. units. There’s more to it than meets the eye: LG worked with Google to craft 32 new Google Assistant commands for tasks like taking a selfie (“Hey Google, take a selfie on a wide angle”), opening the camera app (“Hey Google, open the camera app in manual mode”), and more. In the future, it plans to add voice commands that’ll let you scan a QR code, take an AI Cam photo, and control SmartThinQ smart home appliances, but those aren’t live yet. It’s worth noting that AI Cam, AI Vision, and AI Voice aren’t exclusive to the LG G7 ThinQ. LG’s AI Pack began to roll out to the LG V30 earlier this year, and LG says that it’ll continue to tweak and improve the experience on older devices as long as the hardware supports it. Like the V30S ThinQ, the G7 ships with UX 6.0, the latest version of LG’s Android skin, on top of Android Oreo 8.0. It looks and feels polished, with a minimal amount of bloatware (on the model we tested, at least) and a nifty floating bar that houses shortcuts to LG’s QuickMemo+ note-taking app (which syncs with Google Drive) and starred contacts. There’s support for rudimentary face unlock (a la the OnePlus 5T and Galaxy S9), selectable backgrounds and themes, and links to download optional LG apps such as LG Health. The G7 ThinQ, like the G6, has a dual rear Crystal Clear Lens camera comprising two sensors: A standard sensor and the aforementioned wide-angle sensor. They’re both 16MP (up from the G6’s 13MP)—the wide-angle sensor has a 107-degree field-of-view, and the primary Sony IMX351 CMOS sensor has a f/1.6 aperture and optical image stabilization—and they can capture HDR10 videos in resolutions up to 4K. LG says the all-glass lenses, which the G7 ThinQ shares in common with the V30, have “greater light-collecting ability” than plastic lenses. 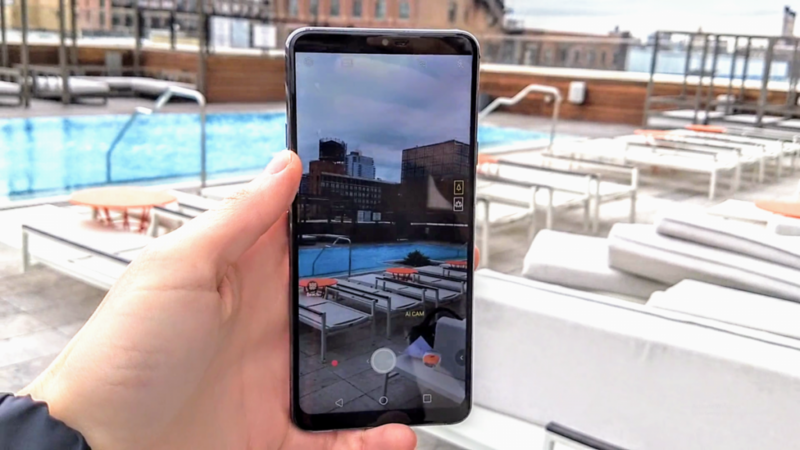 The G7 ThinQ’s camera software features Snapchat-like animated 2D and 3D stickers that spruce up the foreground and background of images, and Live Photo, which captures a burst shot that can be (1) saved as a video or (2) used to select the best picture from a sample (a la Google’s Motion Stills). There’s also Portrait Mode, which blurs the background of images while keeping the subject in focus. The degree of bokeh—that is to say, blur—can be adjusted after the fact, and applied to images taken with either the rear camera or the front-facing camera. Another feature worth mentioning is Graphy 2.0, an improved version of LG’s photo filter generator. Basically, it converts the metadata from photos the camera captures—including the ISO, white balance, and shutter speed—and adjusts the camera app’s settings to match. There’s a small collection of photos to get you started. But the real highlight is Bright Mode, which uses what LG’s calling “superpixel” technology. Basically, the LG G7 ThinQ’s sensor combines light information from adjacent pixels together to form a “superpixel”, which produces videos and pictures that are up to four times brighter than content captured by the G6 and V30. It’s completely automatic; Bright Mode kicks on when the G7 ThinQ detects a pitch-black environment. Under the hood, the LG V30 ThinQ sports a top-of-the-line system-on-chip: the Qualcomm Snapdragon 845, which we benchmarked earlier this year. Here, it’s paired with 4GB of LPDDR4x RAM and 64GB of UFS 2.1 storage (6GB of RAM and 128GB of storage in some international models), depending on the model. The chip is built on a 10nm process and comprises eight custom Kryo cores—four Cortex-A75 “Gold” performance cores clocked up to 2.8GHz and four Cortex-A55 “Silver” efficiency cores clocked at 1.7GHz in ARM DynamIQ configuration. On the visual processing side of things, the Snapdragon 845 packs the Adreno 630, Qualcomm’s latest GPU. That’s two generations ahead of the system-on-chip found on the LG G6: the Snapdragon 821. Other notable peripherals include Qualcomm’s X20 modem, which supports Cat. 18 LTE download speeds up to 1.2Gbps, carrier aggregation, 4×4 MIMO, 256-QAM, and eLLA; the Hexagon DSP, a chip custom-designed for neural network workloads; and Qualcomm’s Secure Processing Unit, a secure element for biometric data. The Snapdragon 845’s power efficiency bodes well for the LG G7 ThinQ’s battery life. Despite the fact that the LG G7 ThinQ’s battery is 3,000mAh—smaller than the G6’s 3,300mAh—LG says it lasts a “full day” on a charge. Also in tow is Quick Charge 3.0 and Qi wireless charging. As for connectivity, the LG G7 ThinQ has a USB Type-C port and supports Bluetooth 5.0 BLE, NFC, FM radio, and Wi-Fi 802.11 a/b/g/n/ac. The LG G7 ThinQ will launch in South Korea first, “in the coming days”. Later this spring, it’ll head to North America, Europe, Latin America, and Asia. LG’s in desperate need of a hit, and it’s swinging for the fences with the G7 ThinQ. It’s got a top-of-the-line processor, a gorgeous display, and AI features that seem genuinely useful, if not particularly innovative. But we can’t help but wonder if the LG G7 ThinQ moves the needle enough to win over would-be buyers. There’s nothing groundbreaking, after all, about dual cameras with great low-light performance, and a few folks are sure to be disappointed with LG’s decision to reserve 6GB RAM/128GB storage for overseas markets. Then there’s the elephant in the room: the notch. It’s not for everyone. Ultimately, the LG G7 ThinQ’s success will depend on pricing, and that’s the one bit of information LG wasn’t willing to share with us. It’ll be up to carriers to determine how much you’ll have to fork over, and if they follow convention, you can expect to see the LG G7 retail for about $700—within striking distance of the Galaxy S9, which starts at $720. Time will tell whether it’s enough to turn LG’s fortunes around.